and am calling them "earthy" for obvious reasons (the clever naming of projects has gone to the wayside folks - I am way too stressed to come up with a clever name for a vanilla pair of socks!). The details are on my Ravelry project page, but for those of you who do not Ravel, they are made of Kroy Jacquards, in Rich Earth Tones colourway, and knit in my standard vanilla sock pattern, on 2.75 mm needles. Knit 'em in tandem for the matchy matchy effect. They have since been gifted by my MIL to a friend of hers who always admires the handknit socks my MIL wears (made by her most excellent DIL - me!). The friend loves them - I am pleased. I have a few more works in progress, but they are not done to a point I can blog them. I shoudl be back in a few days with some pictures. 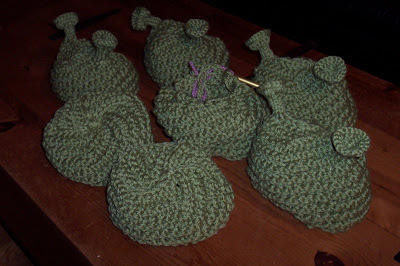 Yes, you are a Shrek hat addict! lol! 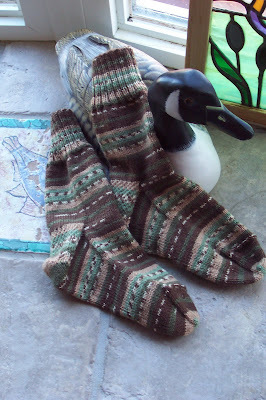 The socks are lovely and I am sure the friend would love them!